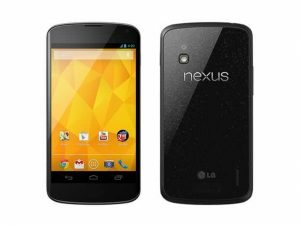 The Google Nexus phone 4 is the first smart phone with tremendous processor and 4G LTE connectivity. The phone has a brilliant 4.7 Inches IPS LCD multi touch screen with 768*1280 pixels resolution. It is powered with 1.5GHZ quad core processor which is accompanied by 2GB RAM to deliver smooth performance. The smart phone is built up with 8MP rear camera with Led flash and 1.3MP front facing camera which gives ultimate images when snapped! Nexus is a great innovation with ultra features and gorgeous display with boosted up processors. All the devices which are given are of high grade image clicking cameras which has HD recording in main cameras. The battery backup is also good in Nexus smart phones with Moe internal storage capacity. The latest versions are also releasing with android 6, New invented version!